Easily put a projector in place and keep it in prime position. Manhattan Universal Projector Ceiling Mounts hold projectors stable and steady with precise tilt, 360° swivel and height adjustments that keep images clear, sharp and defined. Constructed of durable, quality steel materials, Manhattan Universal Projector Ceiling Mounts fit a range of models with a secure, confident and balanced overhead installation. The ceiling plate fits a range of ceiling slopes. Internal cable management helps conceal unsightly cords and connections for a professional, finished appearance. Ideal for home theater, auditorium, office, retail, classroom, video conferencing and other commercial applications, Manhattan Universal Projector Ceiling Mounts help focus attention where it matters most. Easily put a projector in place and keep it in prime position. 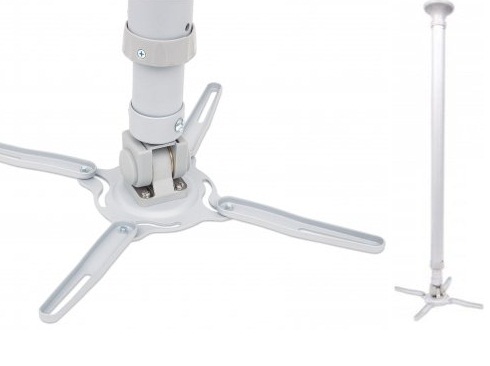 MANHATTAN Universal Projector Ceiling Mounts hold projectors stable and steady with precise tilt, 360° swivel and height adjustments that keep images clear, sharp and defined. Constructed of lightweight, quality aluminum materials, MANHATTAN Universal Projector Ceiling Mounts fit a range of models with a secure, confident and balanced overhead installation. The ceiling plate fits a range of ceiling slopes. Internal cable management helps conceal unsightly cords and connections for a professional, finished appearance. Ideal for home theater, auditorium, office, retail, classroom, video conferencing and other commercial applications, MANHATTAN Universal Projector Ceiling Mounts help focus attention where it matters most.